A 125 cc motorcycle, the Italian-manufactured Cagiva Planet. A motorcycle is a two-wheeled vehicle powered by an engine. Motorcycles are one of the cheapest and most widespread forms of motorized transport for many parts of the world. On a typical motorcycle the operator sits astride the vehicle on a seat, with their hands on a set of handlebars and their feet supported by footpegs. When the bike is at rest, the rider puts one or both feet on the ground. Engine speed is controlled by twisting the throttle on the right side handlebar grip with braking being controlled with a hand-lever and foot pedal. Shifting of gear ratios is controlled by operating a foot lever with the clutch being operated by a hand lever. Steering is accomplished by trained application of slight turning of the handlebars. The inspiration for the earliest motorcycles, and arguably the first motorcycle, was designed and built by the German inventors Gottlieb Daimler and Wilhelm Maybach in Cannstatt (since 1905 a city district of Stuttgart) in 1885. It was the first petroleum-powered vehicle ever, but for the provision of a pair of stabilizing wheels, a motorized bicycle, although they called their invention the Reitwagen ("riding car"). They had not set out to create a vehicle form but to build a simple carriage for the engine which was the focus of their endeavours. However,if one counts two wheels with steam propulsion as being a motorcycle, then the first one may have been American. One such machine was demonstrated at fairs and circuses in the eastern US in 1867, built by Sylvester Howard Roper of Roxbury, Massachusetts. There is an existing example of a Roper machine, dated 1869. It's powered by a charcoal-fired two-cylinder engine, whose connecting rods directly drive a crank on the rear wheel. This machine predates the invention of the safety bicycle by many years, so its chassis is also based on the "bone-crusher" bike. In 1894, the Hildebrand and Wolfmüller was the first motorcycle that was available for purchase. In the early period of motorcycle history there were many manufacturers as producers of bicycles adapted their designs for the new internal combustion engine. As the engines became more powerful and designs outgrew the bicycle origins, the number of motorcycle producers reduced. Up until the First World War, the largest motorcycle manufacturer was Indian. After that, this honour went to Harley Davidson, until 1928 when DKW took over as the largest manufacturer. After the Second World War, in 1951, the BSA Group became the largest producer of motorcycles in the world. The German NSU was the largest manufacturer from 1955 until the 1970s when Honda became the most prominent manufacturer, a title it retains to this day. British manufacturers (Triumph, BSA, Norton) held a dominant position in some markets until the rise of the Japanese manufacturers (led by Honda) in the late 1960s and early 1970s who were able to produce designs faster, cheaper and of better quality. Today, the Japanese manufacturers Honda, Kawasaki, Suzuki and Yamaha dominate the motorcycle industry, although Harley-Davidson still maintains a high degree of popularity in America. Recent years have also seen a resurgence in the popularity of many other brands, including BMW, Triumph and Ducati. The chassis (or frame) of a motorcycle is typically made from welded aluminium or steel (or an alloy) struts, with the rear suspension being an integral component in the design. Carbon-fiber is used in a few very expensive custom frames. Some motorcycles include the engine as a load-bearing (or stressed) member; this has been used all through bike history but is now becoming more common. A plastic or fiberglass shell, known as a fairing, is placed over the frame on some models to shield the rider from the wind. Drag is the major factor that limits motorcycle speed, as it increases at the square of the velocity, with the resultant required power increasing with the cube of velocity. As can be seen from the streamlined appearance of new performance motorcycles, there is much aerodynamic technology included in the design. Unfortunately, no one has been able to overcome the effect of the turbulence caused by the spinning front wheel, which prevents the motorcycle from cutting a clean path through the air. Another problem is the fact that no designs have been discovered that can improve aerodynamic performance without unacceptably compromising the rider's ability to control the machine. In the absence of a fairing or windshield, a phenomenon known as the windsock effect occurs at speeds above 100 km/h, where the rider becomes a major source of drag and is pushed back from the handlebars, tiring the rider. However, these motorcycles still effectively push their way through the atmosphere with brute force. Cabin cycle solved the problem of aerodynamics by isolating driver from outside air. Modern designs have the two wheels of a motorcycle connected to the chassis by a suspension arrangement, however 'chopper' style motorcycles often elect to forego rear suspension ("rigid frame"). The wheel rims are usually steel or aluminum (generally with steel spokes and an aluminium hub) or 'mag' type cast or machined aluminum. At one time, motorcycles all used spoke wheels built up from separate components (see wheelbuilding), but, except for Dirtbikes, one-piece wheels are more common now. Performance racing motorcycles often use carbon-fiber wheels, but the expense of these wheels is prohibitively high for general usage. Almost all commercially available motorcycles are driven by conventional gasoline internal combustion engines, but some small scooter-type models use an electric motor, and a very small number of diesel models exist (e.g., the USMC M1030 M1). The Displacement is defined as the total volume of air/fuel mixture an engine can draw in during one complete engine cycle. In a piston engine, this is the volume that is swept as the pistons are moved from top dead center to bottom dead center. To the layperson this is the "size" of the engine. 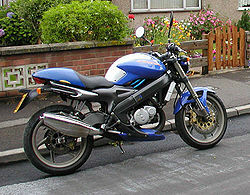 Motorcycle engines range from 50 cc (cubic centimetres), commonly found in many small scooters, to 2294 cc, the largest production engine currently made by Triumph for its Rocket III cruiser-style motorcycle. Motorcycles have mostly, but not exclusively, been produced with one to four cylinders, and designers have tried every imaginable layout. Engines with more cylinders provide more power for the same displacement, and feel smoother to ride. Engines with fewer cylinders are cheaper, lighter and easier to maintain. Water-cooled motorcycles have a radiator (exactly like the radiator on a car) which is the primary way their heat is dispersed. Water is constantly circulated between this radiator and the cylinder when the engine is running. Air-cooled motorcycles have no "cooling system," as such. As air blows past the engine case, it disperses heat. The cylinders on these bikes are designed with fins to aid in this process. Air cooled bikes are cheaper, simpler and lighter than their water-cooled counterparts. As applied to motorcycles, two stroke engines have some advantages over equivalent four-strokes: they are lighter, mechanically much simpler, and produce more power when operating at their best. But four-strokes are cleaner, more reliable, and deliver power over a much broader range of engine speeds. In developed countries, two-stroke road-bikes are rare, because - in addition to the reasons above - modifying them to meet contemporary emissions standards is prohibitively expensive. Almost all modern two-strokes are single-cylinder, air-cooled, and under 600 cc. Modern motorcycles normally have five or six forward gears. Only the largest touring motorcycles (most prominently, the Honda Goldwing) and a few models that are routinely used with a sidecar are fitted with a reverse gear. The clutch is typically an arrangement of plates stacked in alternating fashion, one geared on the inside to the engine, and next geared on the outside to the transmission input shaft. Whether wet (rotating in engine oil) or dry, the plates are squeezed together by a spring, causing friction buildup between the plates until they rotate as a single unit, driving the transmission directly. A lever on the handlebar, through a cable or hydraulic arrangement, uses mechanical advantage to release the clutch spring, allowing the engine to freewheel with respect to the transmission. The most commonly used transmission is a sequential gearbox. From neutral, either first or second gear can be selected, but higher gears may only be accessed in order - it is not possible to shift from second gear to fourth gear, without shifting through third gear. Final drive from the gearbox to the rear wheel is typically accomplished with a chain, which requires both lubrication and adjustment for elongation (stretch) through wear. The lubricant is subject to being thrown off the fast-moving chain and results in grime and dirt buildup. Chains do deteriorate, and excessive wear on the front and rear sprockets can be dangerous. Many manufacturers offer cruiser models with final drive options of a belt or a shaft. A belt drive is still subject to stretch, but operates very quietly, cleanly, and efficiently. However, belt drives are limited in the amount of power they can transmit. The belt is frequently toothed. A shaft drive is completely enclosed, the visual cue is a tube extending from the rear of the transmission to a bell-housing on the rear wheel. Inside the bell housing a bevelled gear on the shaft mates with another on the wheel mount. This arrangement is superior in terms of noise, cleanliness, and is virtually maintenance free. However, the additional gearsets are a source of power loss and add to bike weight. Scooters normally have a continuously variable transmission (CVT). CVT is a type of automatic transmission (also occasionally used in cars) that can change the "gear ratio" (gears are not generally involved) to any arbitrary setting within the limits. The CVT is not constrained to a small number of gear ratios, such as the 4 to 6 forward ratios in typical automotive transmissions. Motorcycles mainly use pneumatic tires ('tyres' in the UK) however, in some cases with off road motorcycles, the tires are filled with a type of mousse which helps prevent punctures. Both types of tires come in many configurations, the most important characteristic of any tire being the contact patch. That is the small area that is in contact with the road surface while riding. There are tires designed for dirtbikes, touring, sport and cruiser bikes. Dirtbike tires have knobby, deep treads for maximum grip on loose dirt, mud, or gravel — such tires tend to be less stable on paved surfaces. Touring tires are usually harder rubber and last longer but provide less grip (significantly less grip while cold, and the heavier rubber takes longer to warm up), while sport/performance tires provide amazing grip but may only last 1,000 miles (1,600 km) or less. Cruisers and "Sport Touring" tires try to find the best compromise between grip and durability. Some cruiser tires have raised white lettering on the sidewalls as a "retro" detail. There are generally two independent brakes on a motorcycle, one set on the front wheel and one on the rear, however, several models have "linked brakes" which apply both at the same time. The front brake is generally much more powerful than the rear as roughly 2/3rds of stopping power can come from the front brake. Brakes can either be drum or disc based, with disc brakes being more common on large, modern or expensive motorcycles for their far superior stopping power, particularly in wet conditions. There are many brake performance enhancing aftermarket parts available for most motorcycles including brake pads of varying compounds and steel braided brake lines. Some manufacturers have created Antilock braking systems (ABS). With dirtbikes excluded, almost all motorcycles have a speedometer, an odometer and a tachometer. Fuel gauges are becoming more common, however traditionally a reserve tank arrangement has been used with a petcock (petrol tap) on the side of the motorcycle allowing the rider to switch to a reserve fuel supply when the main fuel supply is exhausted; this is typically done while the vehicle is in motion. There is not actually a separate reserve tank: The intake for the petcock has two pipes, one extending higher into the fuel tank than the other. When fuel no longer covers the long pipe, the rider switches to the shorter pipe. Riders without a fuel gauge usually learn how many miles/km they can go with a full tank of fuel, and then use a trip meter if available to judge when they must refill the tank. Across the world, and both past and present, motorcycles have been associated with subcultures of society. Some of these subcultures have been loose-knit social groups such as the Cafe racers of 1950s Britain, and the Mods and Rockers of the 1960s. Others are purportedly fraternal organizations, the most well known of these being the Hells Angels. Most motorcycle organizations have law-abiding and peaceful members, and many raise money for charities through organized events and rides. Motorcycles have a far higher rate of crippling and fatal accidents per unit distance than automobiles. According to the US Highway Safety Authority, in 2002 20.9 cars out of 100,000 ended up in fatal crashes. The rate for motorcycles is 66.7 per 100,000. Given that motorcycles cover less distance than cars per year on average, the figure per unit distance is likely to be much worse. Many of these accident are caused by car drivers, though; they tend to underestimate the speed and acceleration of motorcycles, or to simply overlook them. The most common type of motorcycle accident is caused by inattentive drivers making a turn directly in front of a motorcycle. A motorcycle stays upright when it is steered to keep its center of gravity over its wheels. Lock the steering of a motorcycle and it is virtually impossible to ride. Cancel the gyroscopic effect of rotating wheels by adding counter-rotating wheels, and it can still be easily ridden. This page was last edited on 28 November 2010, at 05:50.